When it comes to books released by The Hockey News I find they are either well done or forgettable, with no middle ground. 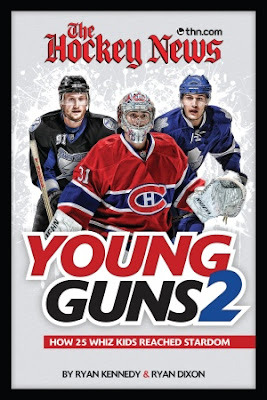 I am far more inclined to include Young Guns 2 in the well done category. Co authors Ryan Kennedy and Ryan Dixon provide solid writing as they explore how 25 of the NHL's rising super stars reached stardom. They unearth some amazing stories of the various backgrounds of some of these amazing athletes. Like howe Carey Price's father flew he son to games and practices, or how Erik Karlsson learned the values that lead him through life from a lumberjack, or how Logan Couture hated skating and hockey the first time he tried learning how to skate. It is stories like that allow us to peek into their world and give us a better appreciation of the sacrifices these players and their families made to accomplish their dream of playing in the National Hockey League. Other players profiled include Jonathan Toews, Steven Stamkos, Drew Doughty, Taylor Hall, Jordan Eberle, PK Subban, Claude Giroux, Milan Lucic and John Tavares. The book also rushes to include a "Future Young Guns" section which headlines Ryan Nugent-Hopkins, Tyler Seguin and Gabriel Landeskog. Considering the late release date these profiles seem underwritten, rarely talking about what these youngsters have accomplished early in this season. It is the story telling that makes the book, but The Hockey News also invested wisely into a high quality presentation, which is something they sometimes skimp on. This books is full of brilliant colour photography lining its 185 glossy pages.